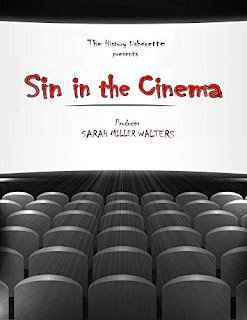 In this latest History Usherette book, the torchlight sweeps across the cheap seats and reveals some very illegal goings-on. From spivs and prostitutes to murderers and mayhem, all human life went to the flicks with trouble in mind during the heyday of British cinema. 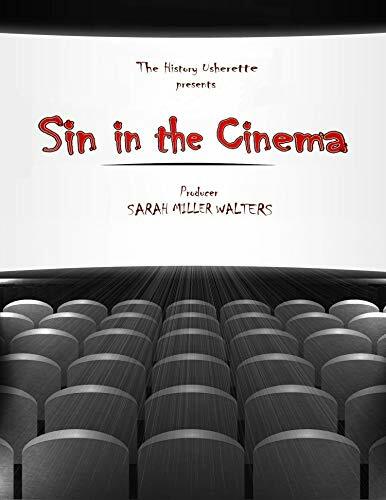 The History Usherette brings together some of the most fascinating crimes, illuminating British society at its worst. Prepare to be appalled. The three heroes of “Ask a Policeman” have their cushy lives rumbled when the BBC come along to celebrate the “lack of crime” in Turnbotham Round. A letter from the powers that be states that as there is no crime in the village, there is no need for their jobs to exist. They then of course set themselves the task of defeating a few crimes in order to keep their paypackets, and the crime that they have chosen to defeat is speeding. Some of the best scenes in the film follow, as they measure out timings and distance and attempt to catch drivers in the act of breaking the law. “How unkind of you” was the reply of a woman motorist of Taunton, when told by a police officer that she would be reported for having exceeded the 30 mph speed limit. She also observed “one does not notice the speed, does one?” She was fined £1. The outbreak of the war in September considerably reduced the number of speeding cases. From an average of 2,500 cases per month in the first part of the year, in November there were less than 1,000 cases. 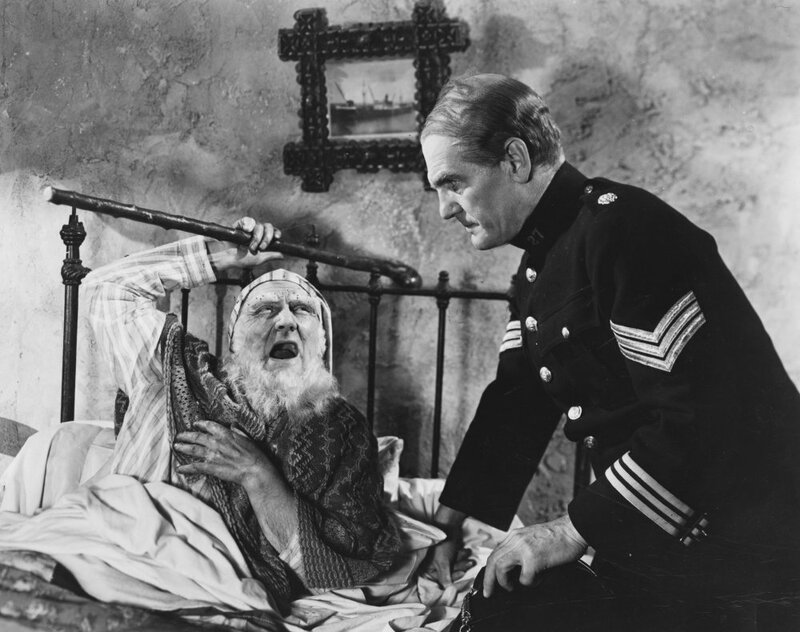 Will Hay’s sidekicks, Moore Marriott (the old man) and Graham Moffatt (the fat lad) are as well-loved as the main man himself. Marriott plays old Harbottle, prematurely aged after seeing the headless horseman driving the phantom hearse. It made all his teeth fall out. The scene where he explains this to the Chief Inspector is priceless. When he isn’t doing his constable-ing around Turnbotham Round, Harbottle runs the local stores. This shop offers a wonderful peep into rural retail customs of the day. Next time you watch ‘Ask a Policeman’ (you never watch this film just once, it bears repeated viewings) take your eyes off the main characters while they are in the stores and see what’s going on in the background. First of all there is the library, with its notice imploring readers not to tear out pages. It seems rather a limited selection and I’m sure local avid bookworms would not be satisfied! Before local authorities opened public libraries, then you would have to use a subscription library within a shop – Boots famously ran one for several years and it features in ‘Brief Encounter’. Then we have the brilliant notice outside the shop - “Funerals undertaken and other odd jobs”. It seems Harbottle was happy to bury your granny and put your shelves up on the same day. Much of the fun in ‘Ask a Policeman’ is based around smuggling. The proper old fashioned smuggling that abounds in Cornish legend and the like – barrels of rum left in caves, mysterious lights and tunnels, villagers that clam up when a stranger is within earshot. I wanted to know if this kind of smuggling did still go on in 1939, or if Will and the gang were just taking us back in time to distract from the imminent world war. I only came across one newspaper report from 1939 that was anything like the old smuggling stories – and this smacked more of ‘Whisky Galore’. In July of that year, ‘The Cornishman’ newspaper reported that casks of wine from a recent shipwreck were being washed up on Cornish beaches, and that the locals were rolling them home and getting drunk on the contents, making themselves “insensible”. As you would. But the more upright members of society were discussing whether the smuggling laws applied to this case because the intoxication was untaxed. So dry were the legal points being discussed in this case, I couldn’t be bothered to find out what the upshot was. Sorry. None of the reports say what happened next…. That man Hitler dominated the main headline, as he had refused all talks with the Poles. And to prove that it was obvious to all that war would be declared the following week, child evacuation plans were well under way. Teachers had been recalled from their summer holidays in order to rehearse the evacuation process, while 250,000 parents were given advice. London Fire Brigade officers had also been told to cut short holidays and return to duty. There must have been a sense of impending doom hanging over London at that point – I wonder if people found ‘Ask a Policeman’ helpful in temporarily forgetting their worries, or if personal anxieties over-rode the wonderful sense of comedy in this film and it only began to be properly appreciated later on. In lighter news, nine wedding guests got stuck in a lift in Stepney and the bride was completely unaware at the time. Meanwhile, there is the heart-warming story of two sisters who shared children. One sister had given birth to two children, while the other one’s union had not been blessed with the bawling of tiny lungs. The children therefore spent alternate weeks at each house, swapping over every Saturday. Without knowing the children, it is difficult to pinpoint which sister was kindly and generous – the one who gave her pride and joy away every other week, or the one who gave her sister a well needed break…Depends on whether they were the kind of kids who got sent to St Michaels' doesn’t it? Like many of George Formby’s previous films, ‘Get Cracking’ was directed by Marcel Varnel. 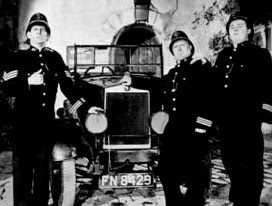 Varnel also worked with other British comedy legends such as Arthur Askey and Will Hay (and I will be focussing on ‘Ask a Policeman’ next). Surely the man who turned out such loved and remembered comedy classics as ‘Oh, Mr Porter!’ should be a bit more famous than he seems to be. I searched the British Newspaper Archive for his obituary to try and find out more about his life. However, all I could find was the same single paragraph marking his death, tucked away at the bottom of the page in numerous provincial news sheets. And it’s not as if he died when his star had long since faded. Don't be fooled by the friendly smile...the man'a foreigner doncha know. Varnel was killed in 1947, when he was aged just 53. He had been working up to the end, and his car crash death was unexpected. But there it is – a single paragraph stating that the French-born Varnel had trained in Hollywood then spent the 1930s and 40s making films in Britain. They all stressed that he was a British citizen at the time of his death, as if that had some kind of bearing on his demise, or the sadness of it. There is no mention of family, no quotes from Formby or Askey. What a sad dismissal from this life for someone who helped to make so many people happy. It just goes to show that directors then were held in nothing like the esteem that they are today. It seems that Varnel was viewed as a Frenchman first and Director second. What a difference a few miles of water can make to a man’s reputation. During the course of ‘Get Cracking’ we get other glimpses of wartime initiatives. 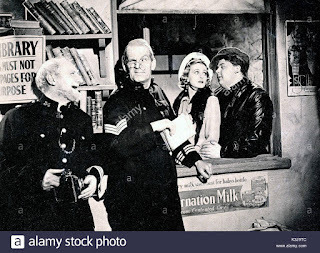 While introducing his new tank to the people of Minor Wallop, George gets back into the sulking Mary’s good books by using it to help her to sell saving stamps. 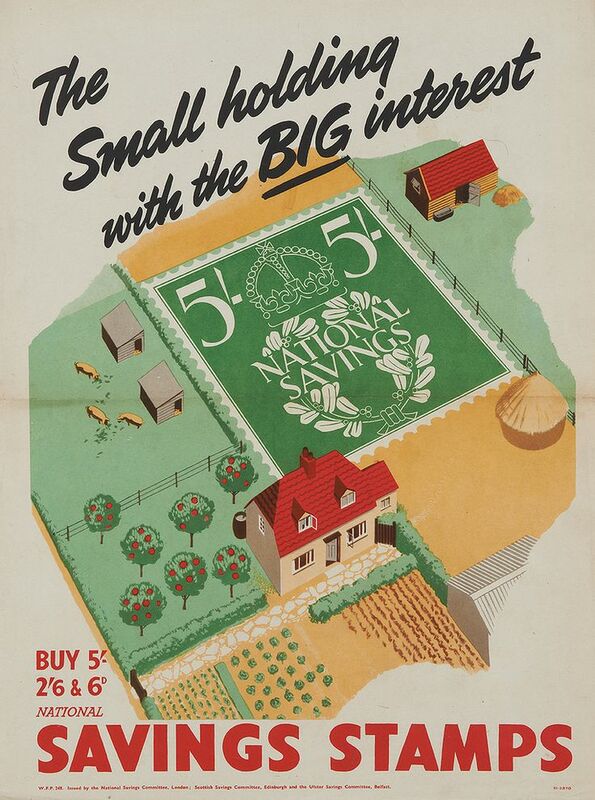 The government encouraged people to use their national savings scheme in order to fund the war. Stamps could be purchased for various amounts and stuck onto a card. Full cards could then be exchanged for a bond which attracted a good interest rate. 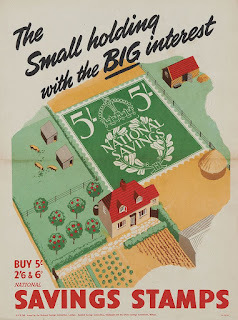 This use of a tank to help publicise them reflected real life, where communities might be encouraged to buy enough stamps to meet the cost of a Spitfire. Strangest wartime glimpse of them all in this film is the young girl evacuee that is billeted at George’s house. For the purposes of the film it appears that they live together alone, something that is highly incongruous to modern eyes. Perhaps another example of Formby trying, but being no longer able to pass himself off as a youngster. Having said that, there is one scene where a housekeeper figures appears to be hovering in the background, waiting to take the young girl inside. But still, would a single little girl have been billeted with a single man? I’m torn between finding this hard to believe and that knowledge that evacuees were often difficult to place – and perhaps some were put into unsuitable houses just to get them off the billeting officer’s hands. Or is it all artistic licence? My new collection of short stories is available for download now. Three of the five stories are set in wartime Skipton, Yorkshire. 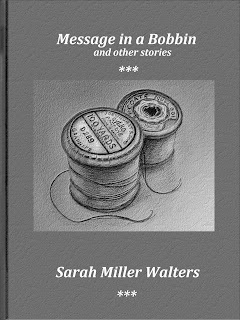 Each one was inspired by a Yorkshire Post newspaper article about something connected with the Belle Vue Mill, home of the Sylko cotton reel.